This is a perfect recipe to add a little exotic flavor to your life without having to go out and buy 500 ingredients that you may never use again. Because you’re slicing the beef very thin and cooking it quickly, you don’t have to break the bank with pricey cuts of meat- a simple marinating cut will do just fine and can be picked up for only a couple of dollars. This recipe also works really well with slices of chicken if that’s your preference. To make the thin slices of beef or chicken easier to accomplish, put the meat in the freezer for 10 minutes or so before you start cutting so that it is firmer and easier to work with. 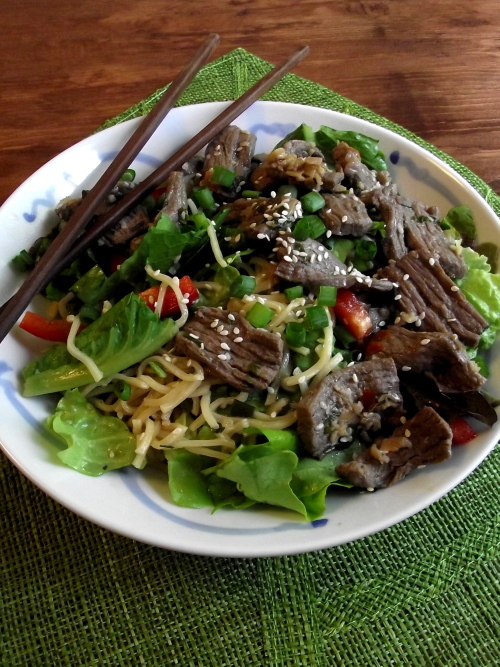 Combine all ingredients except the red pepper, green onion, lettuce, steak & noodles. Mix together well and then slice your steak up as thinly as you can and let in marinade in the dressing for at least 1 hour. Prepare the noodles according to package directions and then rinse with cold water to prevent them from over cooking. Drain noodles well and set aside. In a large skillet on medium high heat, sear your steak slices for about 2 min or until they are only slightly pink. Remove steak (leaving the marinade in the pan) and toss cooked noodles in the hot pan with the marinade. 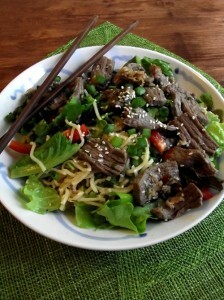 Place noodles over lettuce, top with steak and pour over any remaining marinade from the pan. Garnish with green onion, sesame seeds & red pepper slices and enjoy!